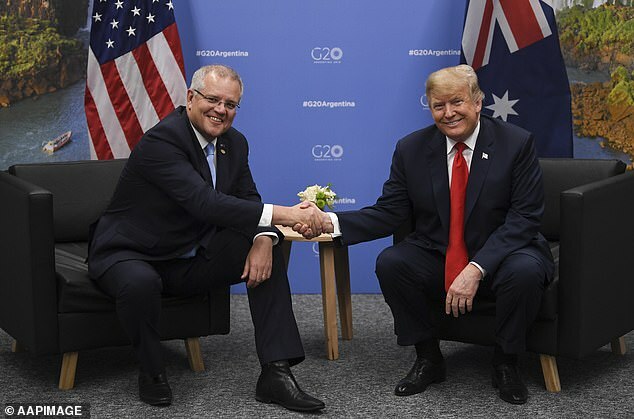 US President Donald Trump has praised his Australian counterpart Scott Morrison after the two met for the first time at the G20 summit in Argentina. The prime minister spoke to the president ahead of a key meeting at the summit between Mr Trump and Chinese President Xi Jinping. ‘Just getting to know each other and so far so good, I think it’s going to be a great relationship,’ Mr Trump said in the meeting in Buenos Aires on Friday local time. ‘I know you’ve done a fantastic job in a very short period of time. The escalating China-US trade war is overshadowing the meeting of the world’s key leaders, which began overnight, but Mr Morrison said the US is pursuing a clear course ahead of its meeting with China on Saturday night local time. ‘Whether they come to an agreement tomorrow, really only they can discern that,’ Mr Morrison told reporters after he met Mr Trump. 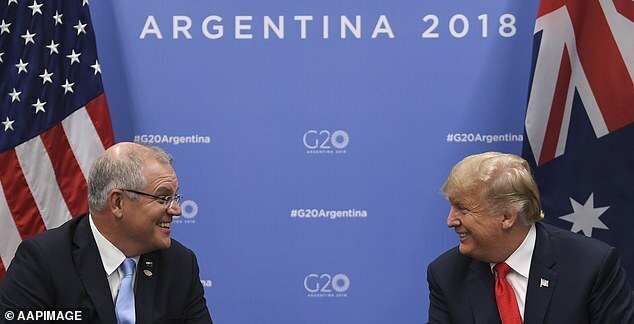 The New York Times has described Mr Trump as ‘lonely’ at the world summit and said his only friend was Mr Morrison. The prime minister said he also took Mr Trump through the process of how Mr Turnbull was replaced and how he became prime minister in August. ‘We just ran through what the events were,’ Mr Morrison said. Mr Turnbull visited the White House in February, posing for smiling pictures with Mr Trump and successfully pressing him to exempt Australian steel from tariff hikes. The US has been pushing China hard on intellectual property theft, and World Trade Organisation rules that still give China developing nation status. As part of his negotiating tactics, Mr Trump has slapped hundreds of billions of dollars of tariffs on Chinese goods, sparking similar tariffs in response. ‘In the past they’ve sought to take a fairly orthodox approach … what we’ve seen more recently you wouldn’t describe as orthodox, but that doesn’t mean the objective isn’t the same,’ Mr Morrison said. 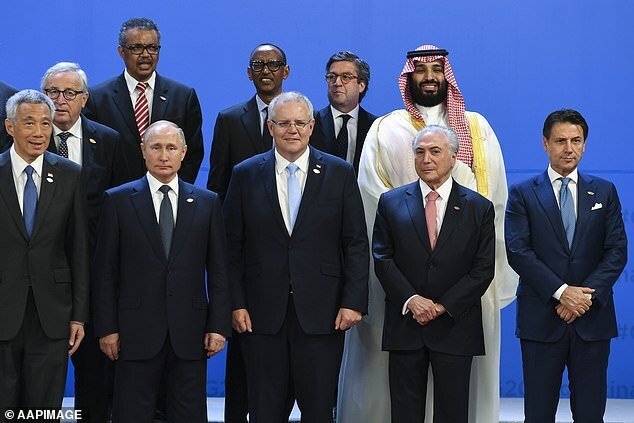 The G20 started with a group photo and a warm handshake between Russian President Vladimir Putin and Saudi Arabia’s Crown Prince Mohammad Bin Salman, who is accused of ordering the murder of journalist Jamal Khashoggi. Mr Morrison told a group meeting of leaders Australia’s economic success was built on multi-lateral, open trade. Angus Livingston to declare global trade is in its worst crisis since 1947. The US has been undermining the World Trade Organisation by refusing to appoint new trade judges, leading WTO boss Roberto Azevedo to declare global trade is in its worst crisis since 1947. The European Union has proposed changes to the WTO in a bid to appease the US, but so far no resolution has been found. Mr Morrison also met with French President Emmanuel Macron to discuss the navy submarine contract, reforming the WTO and cooperation in the Indo-Pacific. The G20 includes Argentina, Australia, Brazil, Canada, China, Germany, France, India, Indonesia, Italy, Japan, Mexico, Russia, Saudi Arabia, South Africa, South Korea, Turkey, United Kingdom, United States and the European Union.